For those who enjoy the tiny, sweet and tangy seeds of a pomegranate, nutrition offered by the fruit is not always known or even considered. Recent studies, however, have indicated that it has very strong anti-cancer properties, as well as other uses in natural cures and home remedies. Its valuable health and nutrition benefits make this fruit not only a tasty treat, but also one to be celebrated for the vitamins and minerals it contains, which support good health and immunity. In July 2005, the Journal of Urology published findings that juice from the pomegranate may be useful in combating erectile dysfunction. 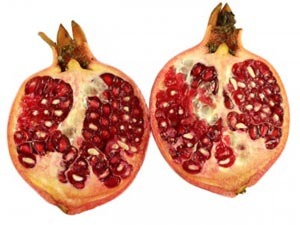 An article published in the American Journal of the College of Cardiology in September of that same year cited that pomegranate juice consumed at the rate of eight ounces per day actually increased the oxygen levels reaching the heart muscles of people afflicted with coronary heart disease. Despite these precautions, a normal amount of actual pomegranate fruit consumption is considered to be safe for children and adults. It is past time for food to be enjoyed merely because of how it tastes. Vegetables and fruits also contain healing properties and immune support that humans cannot afford to ignore. While immensely satisfying as a fruit snack, pomegranate nutrition also offers much of the daily requirements of minerals and vitamins each body needs for optimal performance.